They say giving is better than receiving. After looking at what people did for the first year (this is the third time they’ve been doing this), I knew I wanted to do something fun. My big thing this year has been EDH and my EDH blog (which has more articles almost ready to go). 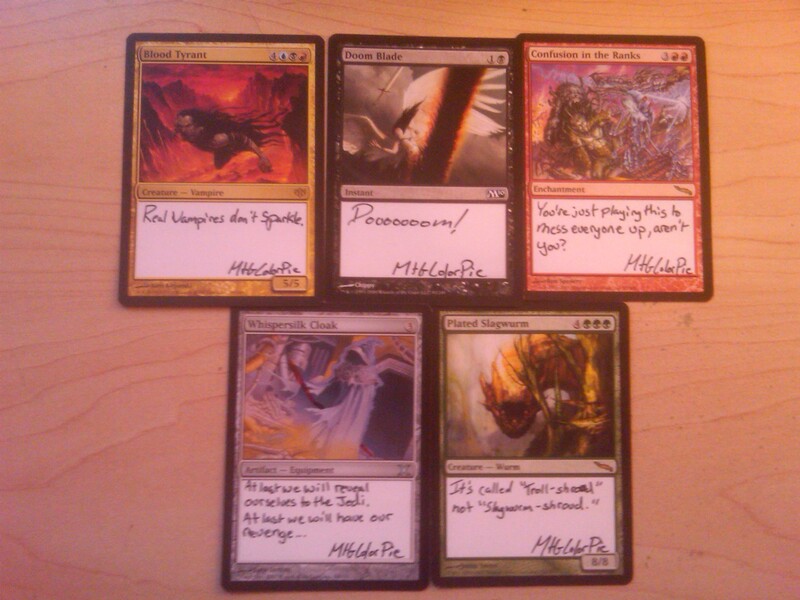 Unfortunately I got into this action a little late and wasn’t able to do a full EDH deck (maybe next year). And with little artistic skills, I was at a loss about what to do. 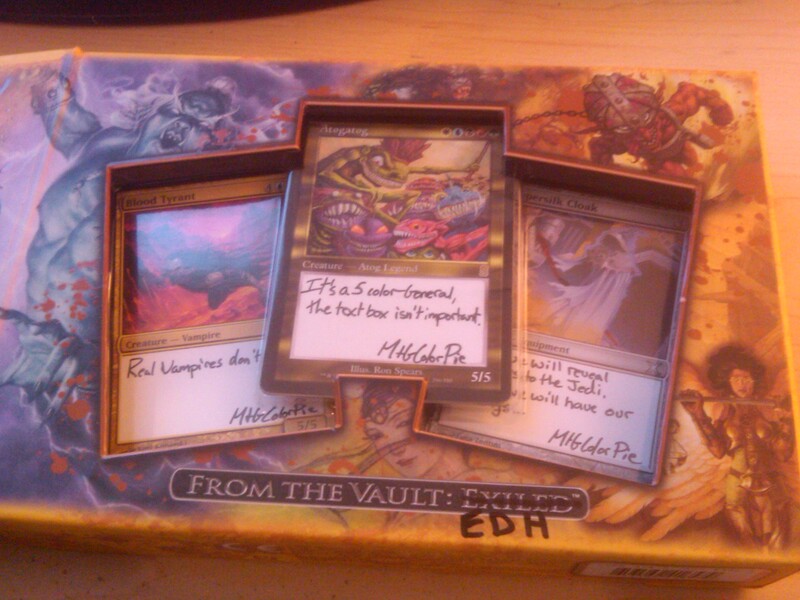 Then, as a see an extra From the Vault: Exiled box lying around, I knew what I had to do: Make a From the Vault: EDH version. True, it’s not the end all, be all cards in EDH, but there’s enough variety and fun in the box of 15 cards to get someone started on the path of EDHness (this is a pic heavy post, so if you have a slow connection, don’t hate me). All the pics are click-able to their full size. This is the back of the box. 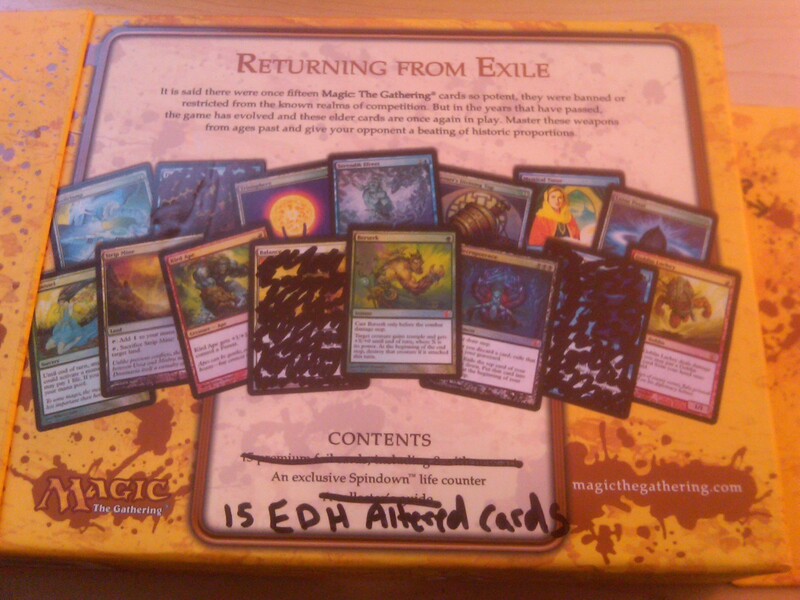 Every instance of “Exiled” on the box was crossed out and written “EDH.” That’s Exiled, with a “D.” The 15 cards on the back from the FTV were not included in the box (sorry), but I did make a few changes: the three cards that are scribbled out are banned in EDH (Balance, Gifts Ungiven and Tinker). 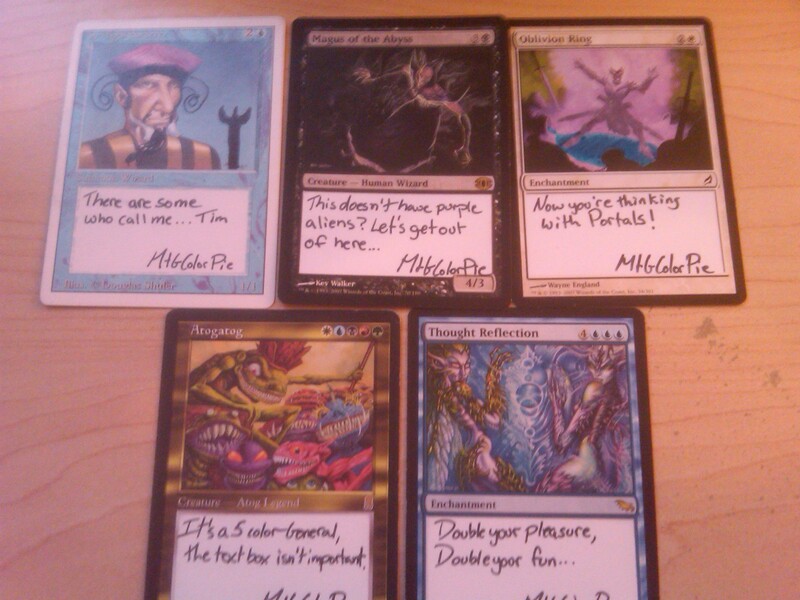 The rest of the cards are allowed in this awesome format. The inside of the box displaying three of the cards. The General is in the middle: Atogatog. 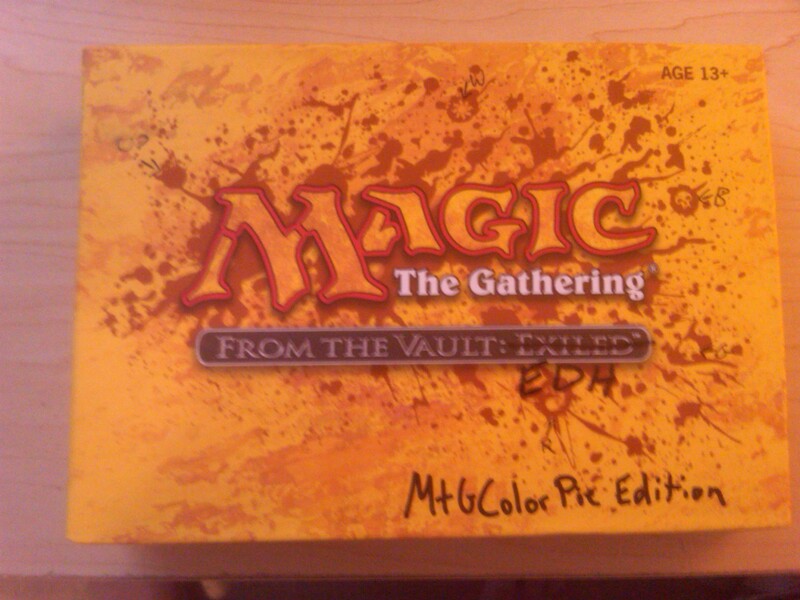 It’s a great 5 color-General to get someone started with the fun of EDH. This also allowed me to add all 5 colors of cards into the gift. You might notice that the text boxes are white. Of course they are; I erased them. If you can read what Atogatog says, it kinda sums up a theme of what I was doing: “It’s a 5 color-General, the text box isn’t important.” All of the text boxes were erased and put something hopefully witty. 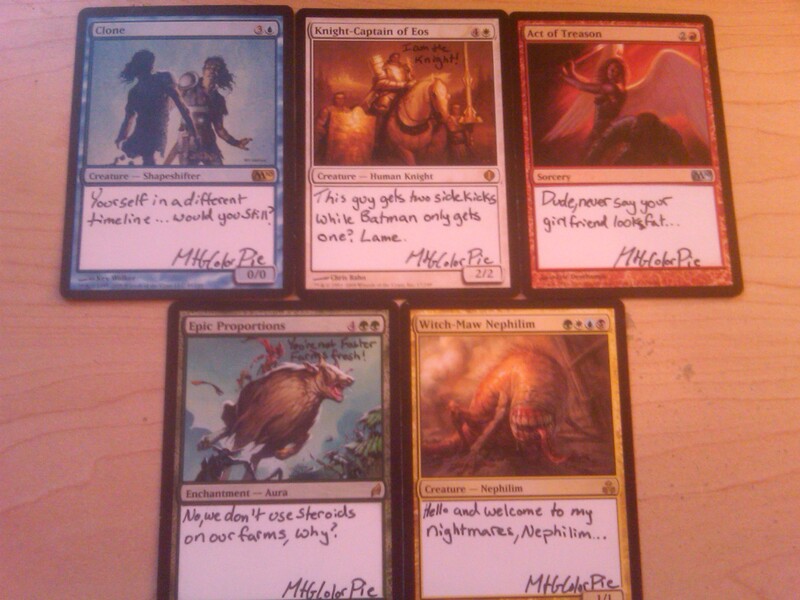 A few of the cards we altered as well. (If you’re wondering how I erased them I put transparent tape around the outside of the text boxes and used a “Magic” Rub brand eraser. Seriously, you can find them at Staples. One of those erasers lasts for quite a while). Knight-Captain of Eos: Altered Art (I am the Knight). “This guy gets two sidekicks while Batman only gets one? Lame.” See: Robin. Act of Treason: “Dude, never say your girlfriend looks fat…” Especially if she’s Akomra. Witch-Maw Nephilim: “Hello and welcome to my nightmare, Nephilim…” Seriously, Whisky Tango Foxtrot? Blood Tyrant: “Real Vampires don’t sparkle.” Twilight books/movies, where they aren’t real vampires. Doom Blade: “Dooooooom!” See: Dr. Doom, and @doom_blade_guy. Confusion in the Ranks: “You’re just playing this to mess everyone up, aren’t you?” See: Confusion in the Ranks card text. If I had an Ice Cauldron, I would’ve put it in with the text: “What now?”. Whispersilk Cloak: Altered Art. “At last we will reveal ourselves to the Jedi. At last we will have our revenge…” Star Wars Episode 1: The Phantom Menace, one of Darth Maul’s two lines. Plated Slagwurm: “It’s called ‘Troll-shroud’ not ‘Slagwurm-shroud. '” See Troll Ascetic. And that’s my part of the exchange. I really hope the person who got them is happy with them. I don’t have much artistic skill, so any stick figures would just seem like an XKCD ripoff.